The 2018 Ford F-150 Limited. DETROIT -- Ford Motor Co. is adding its first-ever diesel variant and a new V-6 engine to the freshened F-150 pickup for 2018 to further boost the fuel efficiency of its top-selling and most profitable product line. The midcycle freshening includes a new 3.0-litre Power Stroke diesel option available in 2018, along with other engine improvements, seven new front grilles, six new wheel styles, updated lights and interior tweaks. They are the biggest changes to the truck since it was radically retooled for the 2015 model year with an all-aluminum body. The Ford F-series was the best-selling pickup in Canada for the 51st consecutive year in 2016, and was the best-selling vehicle in Canada for the seventh year in a row. Ford sold 17,115 total trucks in December, up 3.9 per cent from the year before, and 257,660 total trucks for the year, up 15.1 per cent over 2015. U.S. sales of the F-series rose 5.2 per cent to 820,799 last year, making it the nation’s top-selling truck for 40 consecutive years and most-popular light vehicle for 35 straight years. The growth in F-series sales last year easily outpaced the full-size pickup segment’s 2.7 per cent increase. “This is their A game in terms of what they believe will keep the sales streak going,” said Dave Sullivan, manager of product analysis at AutoPacific. The updated engines should help improve the truck’s fuel-economy ratings, which haven’t beat Fiat Chrysler’s segment-leading Ram, even after Ford’s lightweighting efforts. 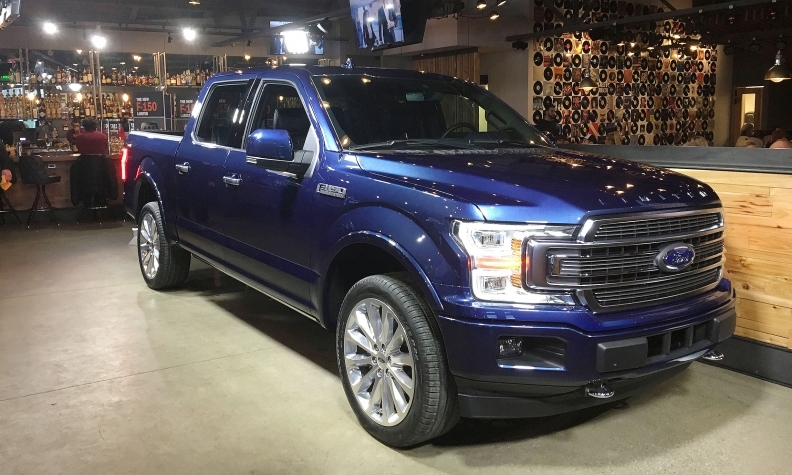 The most recent F-150 with a 2.7-litre EcoBoost engine gets 19 mpg (12.3 litres per 100 kilometres) city, 26 mpg (9.05 litres per 100 kilometres) highway and 22 mpg (10.7 litres per 100 kilometres)combined, trailing the Ram 1500 diesel engine’s 21 mpg (11.2 litres per 100 kilometres) city, 29 mpg (8.1 litres per 100 kilometres) highway and 24 (9.8 litres per 100 kilometres)mpg combined rating. The optional diesel motor will be the first offered on the truck since it went on sale in 1975. The biggest change, the diesel engine option, aims to appeal to truck customers who tow and haul more than usual. The 3.0-litre will be a variant of the Lion diesel engine that Ford builds for use in Land Rover and Jaguar vehicles. It will be produced in England. Ford did not disclose the vehicle's anticipated mpg. 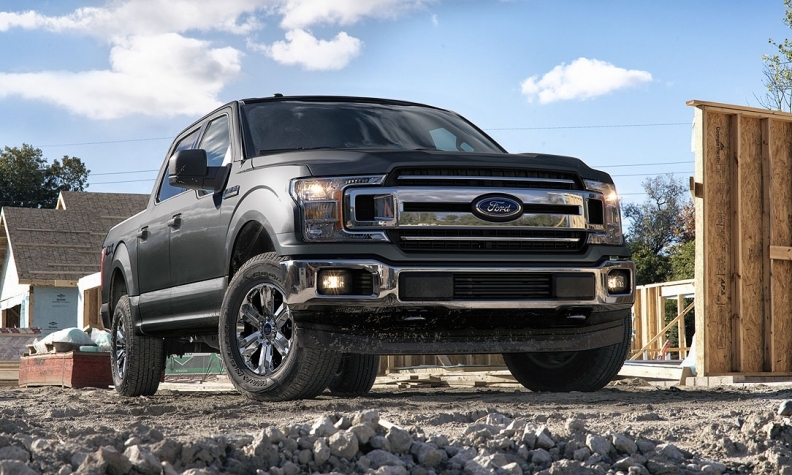 It also isn't saying what F-150 trim levels the diesel engine will be available on, and declined to offer volume projections. Ford offers diesels on its heavy-duty trucks and Transit vans. Different from the Lion engine, they include a 6.7-litre Power Stroke built in Mexico. The addition of the diesel motor is a nod to Ford’s competitors, including the Ram, Chevrolet Colorado and Nissan Titan, among others, which have added diesel variants. Analysts say it will also address the one weak spot in Ford’s EcoBoost engine: the loss of fuel economy when the truck hauls a heavy load. “I have no doubt when you combine a lightweight body, 10-speed automatic transmission, and a 3-liter diesel V-6, there’s definitely the possibility of tying or being the most fuel-efficient half-ton, and I wouldn’t rule out it becoming the most fuel-efficient pickup,” Sullivan said. Ford is also making additions and improvements to the F-150’s gasoline engine lineup. The 2018 F-150 will feature a new entry-level 3.3-liter V-6 with a six-speed transmission. Ford is also updating its 2.7-liter EcoBoost, 3.5-liter EcoBoost and 5.0-liter V-8 engines, and is pairing the truck’s 10-speed automatic transmission with all three. Since its release late in 2016, the 10-speed has been available only on the 3.5-liter. Stop-start technology will come standard on all Ford engines. 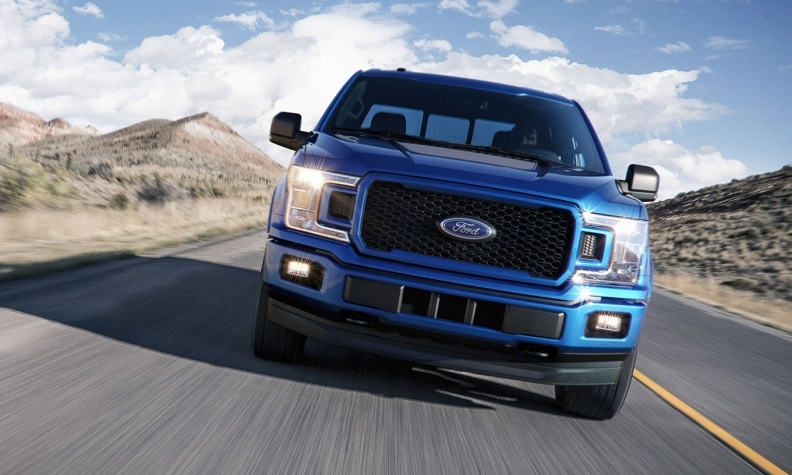 The biggest cosmetic changes come in the F-150’s front end. In an effort to differentiate each of its seven trim levels, Ford is introducing seven new grilles, dropping the traditional tribar design. 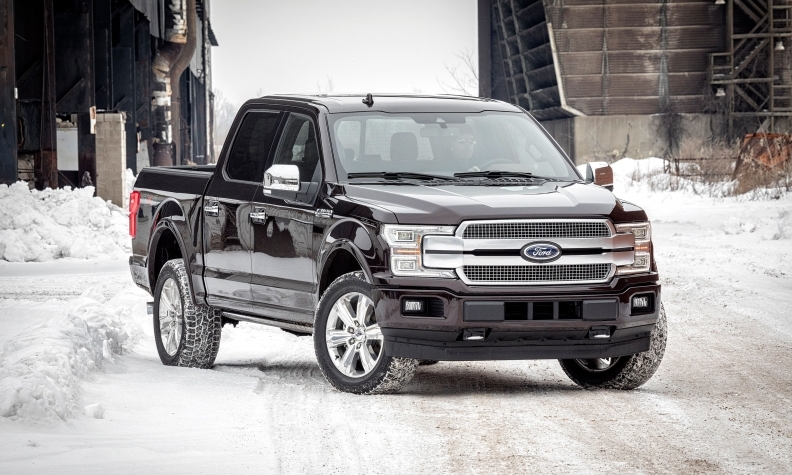 Many trims of the freshened F-150 will feature a design similar to the Super Duty pickup. Other examples include mesh grilles for trucks with sport appearance packages and body-color grilles for the Lariat Sport trim. The truck also features updated headlights, which maintain the C-clamp style that debuted on the 2015 F-150. The rear taillights and tailgates are also new. 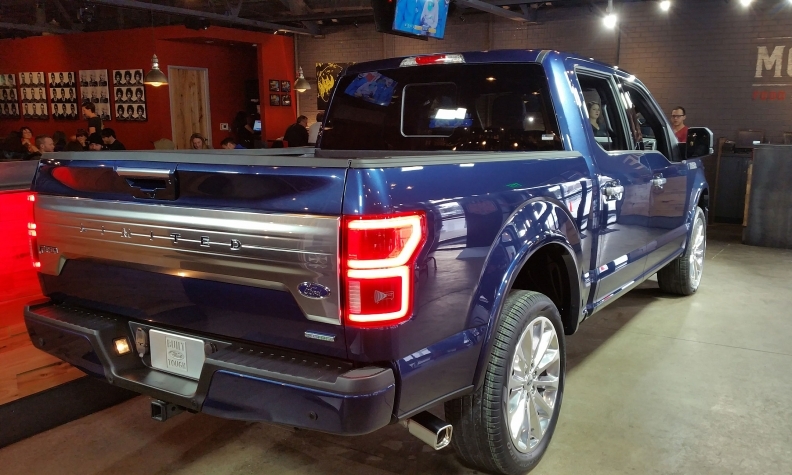 For the first time in an F-150, Ford will include precollision assist with pedestrian detection and adaptive cruise control with stop-and-go technology. Both features have been available on other Ford vehicles. The 2018 F-150 will be the first Ford to include a B&O Play sound system, and will have a Wi-Fi hot spot, a new feature for a number of 2018 Ford vehicles, the automaker announced last week at the CES technology expo in Las Vegas. The truck will hit showrooms this fall, but the diesel engines won’t go on sale until summer 2018. Ford declined to discuss pricing, although the base 2017 F-150 starts around $26,000, and the highest trim level starts at around $59,000.